You wouldn’t be alone if you said you’d never heard of Outcast. It was a title I missed in that era. This was a wildly acclaimed game from 1999 that used an engine considered to be revolutionary at the time. It touted some of the most complex world to world interactions, particle effects, and AI. Outcast required a pretty high-end system to even run, so it ended up being a commercial failure. These advanced systems actually fit right in with our modern gaming now though, so a remake of Outcast makes a lot of sense, given the popularity of modern releases of classic games. Outcast Second Contact is an entirely fresh remake, built on the framework of the original, with a hero that looks like a retro-futuristic version of Nathan Drake. 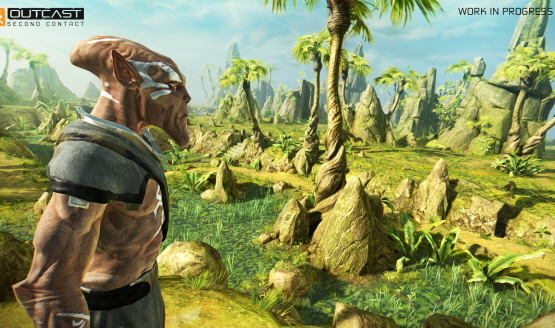 Aside from updating the graphics and tweaking a few things to live in 2017 better than it did in ’99, Outcast Second Contact is the same game that released back then, giving a whole new audience a chance to relive — or live for the first time — the title that received high praise from gaming publications. Check out the trailer above to see the side by side comparisons between the two. One of the most interesting things about Outcast, even 20 years later, is that every NPC in the game is unique. They have their own backstories, questlines, and lives even. Based on the time of day, each of the NPCs will live out their lives and you won’t find them standing in a single repetitive spot. Talking to any NPC will give you more information about languages and the creatures of the worlds, adding to the in-game lexicon and lore library. Gaining all of this information is important as you move through the different worlds and complete the variety of quests that they have to offer. In Outcast, all of your actions will have meaning. Completing quests in one world will impact things in another. It’s something that modern games have had for a while, but to think that they had developed this system back before the new millennium is pretty incredible. The combat is all strafe based shooting, and one of the major things they updated was to make the shooting faster in the modern game. The original game was slow paced to account for the render speeds and processing of the time, which made the remake almost unplayable. It’s small improvements like this that are taking the classic 1999 game and giving it contact with many gamers that may not have even been born at the time it released. Outcast Second Contact is an interesting throwback, with strafe based gameplay that reminds me a lot of Dark Void (why anything reminds me of Dark Void is still a mystery to me, but that’s an article for another time). The advanced world lore, AI, and quest systems from 1999 find a place right at home in 2017 for a game that respects its original release while updating the graphics and some simple aspects to better fit in with the modern era of gaming. Outcast Second Contact releases fall 2017 for PS4, Xbox One, and PC. Check out all of our E3 2017 coverage.